Located 25km (16 miles) outside Dunhuang, the Mogao Caves are the best example of Buddhist cave art to be found in China. 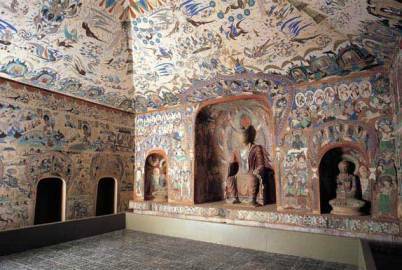 There are almost 500 caves, decorated with 45,000 sq meters of frescoes and over 2,000 painted statues carved into the east side of Mingsha Hill. Legend has it that the cave art was initiated by a monk on a pilgrimage to India in 366AD. It is said that he saw rays of light sparkling in the cliffs, which inspired him to carve a cave to honor Buddha. Subsequently other pilgrims stopped and added their artistic contributions by carving and decorating caves and niches in part as tribute to Buddha and to ensure their own safe journey. 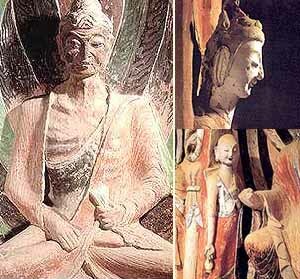 Artistic styles from the Jin dynasty (265-420AD) to the Tang dynasty (618-907AD) can be seen in the caves. The paintings from the Tang era feature many asparas (flying angels) which are a famous characteristic of Dunhuang cave art. and the Dunhuang Books have been scattered worldwide. In 1987 the Mogao Caves were listed as a World Heritage Site by UNESCO.